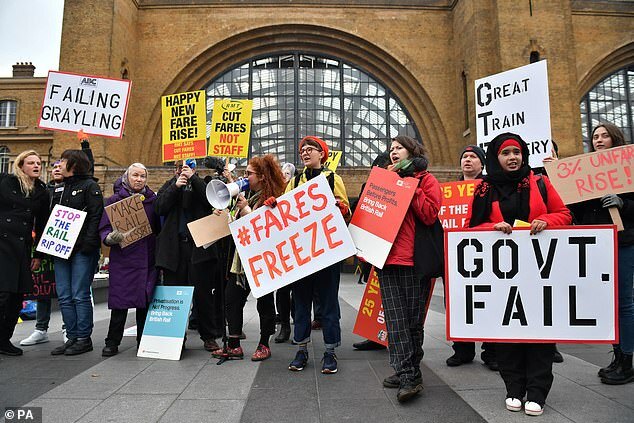 Furious commuters staged protests across Britain today as they faced 'another kick in the wallet' thanks to rail fares rising by an average of more than 3 per cent. 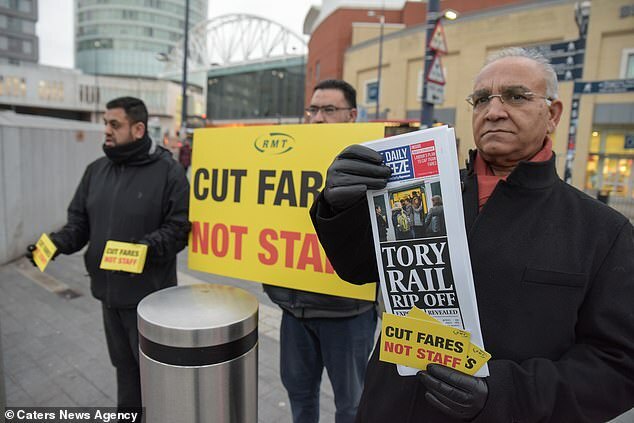 Demonstrations were held at mainline stations across England including Birmingham New Street, London King's Cross and Leeds as anger mounted over the annual hike. To make matters worse for hard-hit commuters, services were cancelled again on some lines today - after the cost of many season tickets rose by more than £100. Southeastern said services may be delayed or cancelled today due to a signalling problem near Deal in Kent which was being investigated by Network Rail engineers. 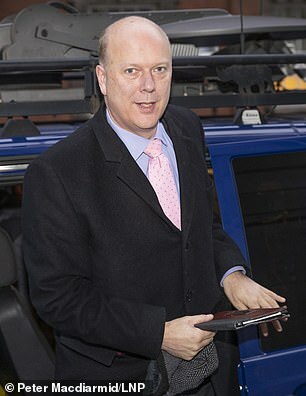 Transport Secretary Chris Grayling blamed trade unions for the increases, while the unions blamed him - as travellers faced up to train punctuality now at a 13-year low. Mr Grayling claimed the Government's 'record investment' in the rail network will help passengers get the 'frequent, affordable and reliable journeys they deserve'. 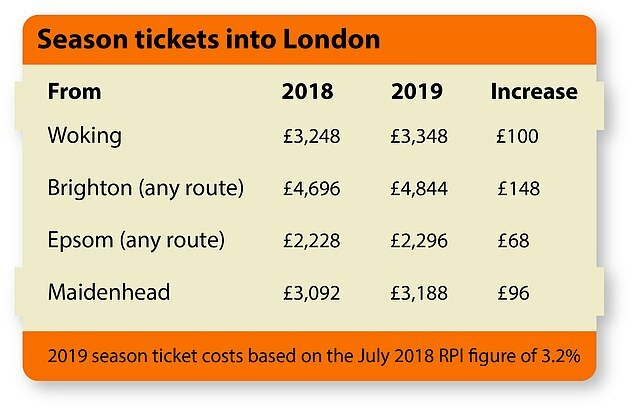 But Labour analysis of more than 180 routes suggests an average commuter is paying £2,980 for their annual season ticket, up £786 from 2010, which was the year the Conservatives came to power as part of a coalition government. The latest rail fare rises have pushed the cost of intercity travel for some commuters above £1 a mile. The anytime standard class fare for the 24-mile journey between Swindon and Didcot Parkway rose today by 80p to £24.20, working out at £1.01 a mile. The Great Western Railway fare is the only choice for passengers buying a 'walk-up' ticket for the 17-minute journey between 6am and 9am. The Heathrow Express is still Britain's most expensive train at £1.70 a mile, according to research by travel expert Simon Calder in the Independent. But the 172-mile trip from Watford Junction to Stockport on Virgin Trains also now works out at £1.02 a mile after the fare rose by £7 to £175.50. Labour also says fares have risen nearly three times faster than wages. But the rail industry insists the 'vast majority' of revenue from fares covers the day-to-day costs of running the railway. Analysis of historical data revealed this is the worst performance since September 2005. Extreme weather, errors in the launch of new timetables, strikes and signalling failures are among the causes. 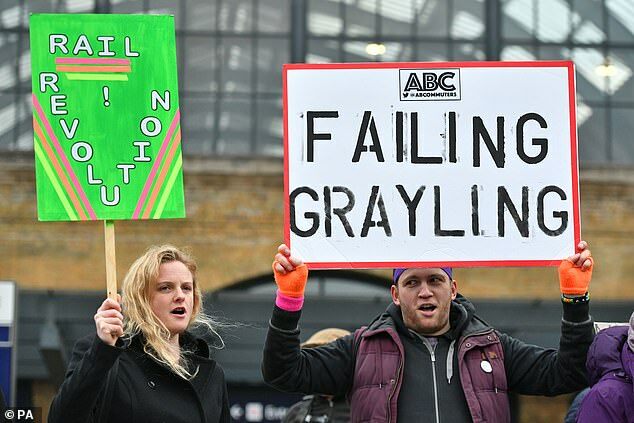 Speaking on BBC Radio 4's Today programme this morning, Mr Grayling said: 'The reality is the fare increases are higher than they should be because the unions demand - with threats of national strikes, but they don't get them - higher pay rises than anybody else. 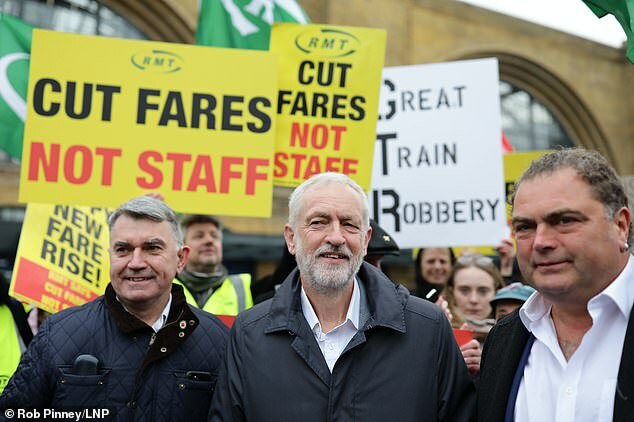 But Labour leader Jeremy Corbyn hit back, saying today's rail fare increases are 'not justified' as he joined protesters outside King's Cross Station, adding that - in the long term - the hike in ticket costs 'drives people away from public transport'. 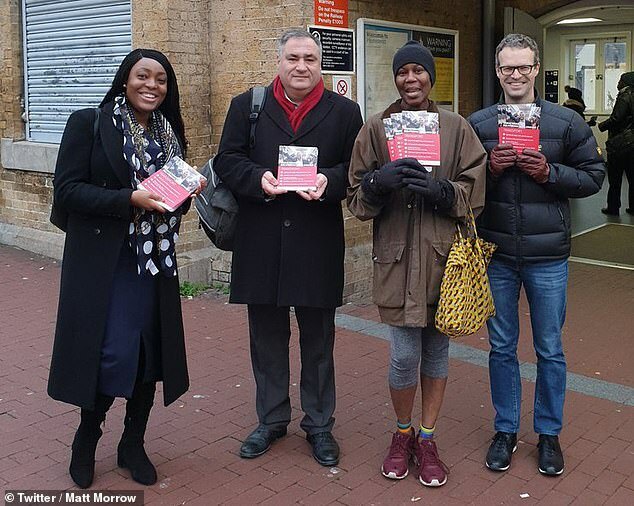 He said fares for the British passengers are 'already the highest in Europe' as he joined campaigners calling for a Government freeze on prices. Responding to Mr Grayling saying the rise will fund the upkeep of the network, Mr Corbyn said the UK must 'invest in our railways as a public investment'. 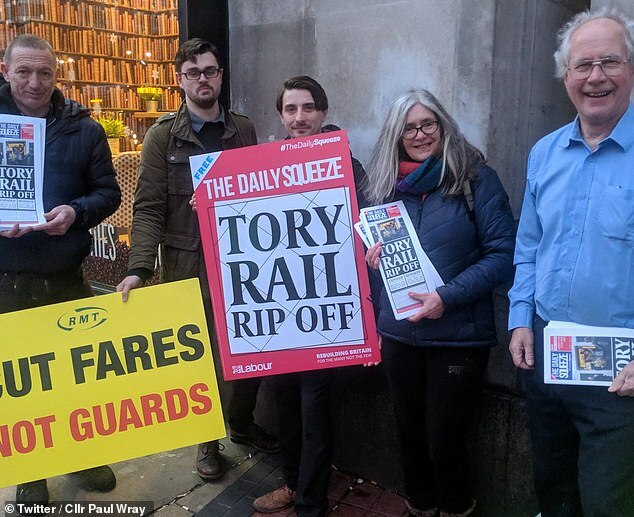 Outside London King's Cross today, two representatives from the RMT union clutched signs that read 'Happy New Fare Rise', wads of cash and wore face masks of Prime Minister Theresa May and Mr Grayling. The annual cost from Prime Minister Theresa May's constituency of Maidenhead to London has increased by £96 (from £3,092 to £3,188). Leading the protest at King's Cross today was Summer Dean, 26, from Brighton, from the Association of British Commuters. She said: 'Fares have gone up by 3.1 per cent, that's following major disruption we have seen across the country. Many commuters raised their fists in support of the protest and cheered as they took photos before hurrying off into the crisp morning. 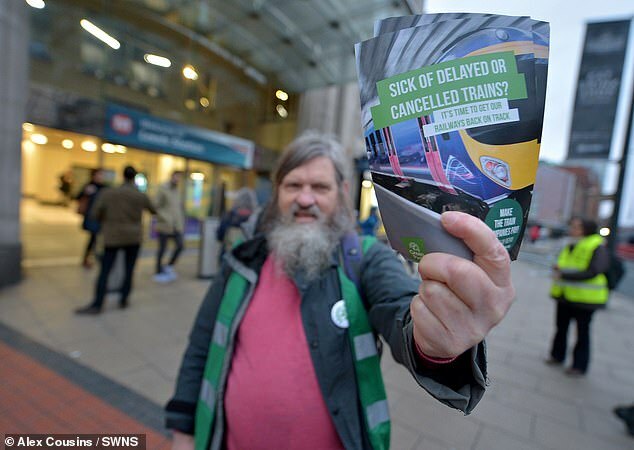 Simon Tilley, 38, who is self-employed and works in auditing and compliance, commutes across the South East of England and said he has had to turn down work because of poor services. Mr Tilley said: 'I'm self employed, I have to travel all over the UK for work and I have had to use a lot of different rail services. Year on year it's got worse. 'I have to turn down work because I can't get there, purely because of unreliable services. Chris Grayling talks about all these improvements but last year was the worst ever for rail. Ellie Harrison, who set up passenger group Bring Back British Rail, said the problem with the country's railway is privatisation. The freelance designer and art teacher from Glasgow said: 'The problem with our railways at the moment is that we are losing a hunger amount of money to trains because we are duplicating services with different companies. 'They all have their own branding, marketing and CEO salaries. We are wasting money as a result. 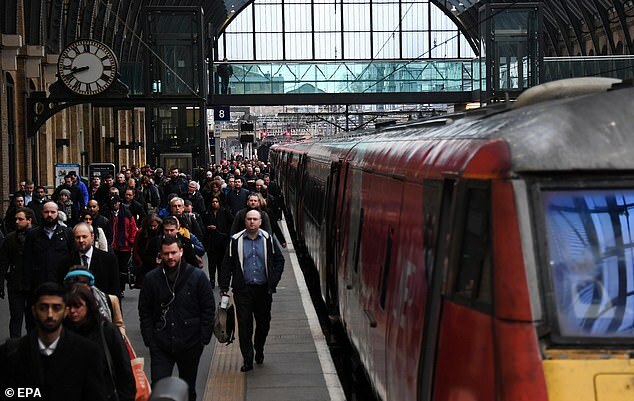 Labour's shadow transport secretary, Andy McDonald, said the franchise system used to run Britain's railways appears to be 'completely broken' and has created a 'farcical situation' that sees profits leak away to other countries - even paying for their own rail networks. 'We need to take these costs and this waste out of the system,' he told ITV's Good Morning Britain. 'The franchising system seems to be... completely broken. 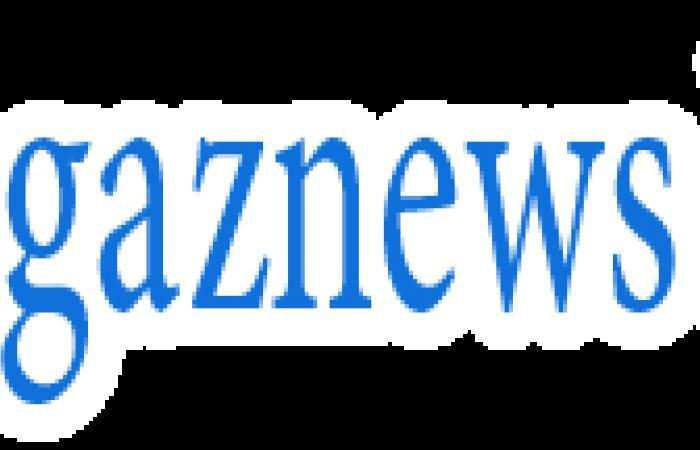 It's very costly to run (with) additional costs incurred of many, many players being involved in the railway industry with the left hand not knowing what the right hand is doing. 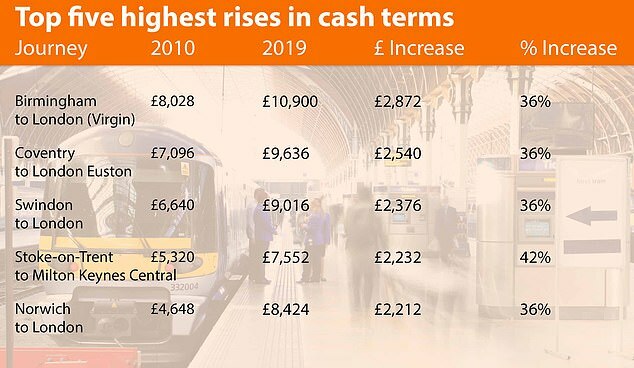 EXAMPLES OF RAIL FARE INCREASES ACROSS BRITAIN THAT COME IN TODAY ROUTE 2018 PRICE 2019 PRICE INCREASE Woking to London £3,248 £3,348 £100 Ludlow to Hereford £2,212 £2,280 £68 Brighton to London (any route) £4,696 £4,844 £148 Manchester to Liverpool (any route) £3,152 £3,252 £100 Neath to Cardiff £1,708 £1,760 £52 Maidenhead to London £3,092 £3,188 £96 Whitehaven to Carlisle £1,920 £1,980 £60 Epsom to London (any route) £2,228 £2,296 £68 Gloucester to Birmingham (any route) £4,108 £4,238 £130 Thetford to Norwich £1,932 £1,992 £60 Tweedbank to Edinburgh £2,732 £2,820 £88 Bangor to Llandudno £1,260 £1,300 £40 Stonehaven to Aberdeen £1,344 £1,388 £44 Weston-super-Mare to Bristol £1,940 £2,000 £60 Stirling to Glasgow £2,160 £2,228 £68 Here are 15 examples of rail fare rises across Britain, including in Prime Minister Theresa May's constituency of Maidenhead and Transport Secretary Chris Grayling's Epsom seat. The table compares the price of a 12-month season ticket bought today with one purchased last year. It does not include the price paid if within-London travelcards are also purchased for Tube and bus journeys in the capital. 'And then of course the profits and the dividends are leaking out the system - often to state-owned and controlled railways across continental Europe going back to subsidise their railways. Millions more young rail passengers will benefit from cheaper fares as prices soar for older travellers. Transport Secretary Chris Grayling boasted last night that new railcards for teenagers and under-30s will cut fares for a 'generation'. But commuters are staging demonstrations at stations today in protest at surging season ticket costs. 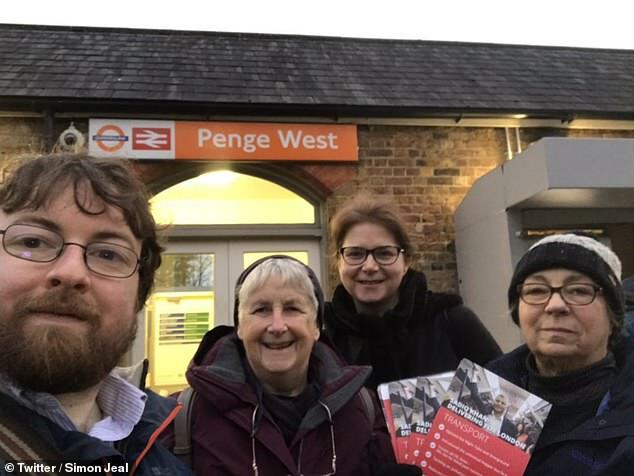 One campaign group said cheaper travel for younger passengers was 'no substitute for fundamental reform' of rail fares which should benefit all. Mr Grayling announced a new railcard for those aged 16 and 17 in a bid to take the sting out of the backlash against fare increases. This will extend half-price child fares to up to 1.2million teenagers, saving hundreds of pounds a year for families. It will guarantee 50 per cent off most fares, including peak, off-peak, super off-peak and advanced tickets, as well as travelcards. The scheme will be launched in September to coincide with the new academic year. 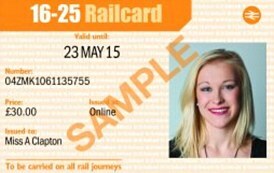 A new national railcard for those aged from 26 to 30 went on sale from midday today, offering up to 4.4million young adults a discount of a third on many rail journeys – although there are no discounts on season tickets.